This wasn’t my first trip to Italy, however. I was fortunate enough to teach for the program in 2011 and had also backpacked through the major sites in my early 20’s, somehow over 13 years ago. It is a strange and beautiful thing to experience a place at different times in life. Since I already had experience and knowledge of the traditional attractions, I could allow myself to go a bit deeper. My goal this time was to seek things I hadn’t noticed or considered before (both small and large), to see details, to make connections. Marble sculptures, Gipsoteca Bartolini, Galleria dell’Accademia, Florence. Saturdays with the program were typically reserved for traveling with the group to nearby cities in Tuscany or Umbria. These days were filled with visits to churches, museums, and other historic points of interest. Inevitably, in visiting such a large number of culturally and/or religiously significant sites, I began to see commonalities among them, historical or otherwise. Whereas, on my last trip I’d noticed the profusion of material remains of enshrined saintly figures common to churches throughout Italy — the so-called Cult of Relics — I had only given their presence a passing thought. But memory is a funny thing. When I reflected on my experience in the years between this visit and the last, I couldn’t shake the memory of these tangible memorials. I kept returning in my mind, for example, to the visible whole remains of Santa Margherita at the Church of Santa Margherita in Cortona, or to the head and disembodied thumb of Santa Caterina in the Church of San Dominico in Siena. When I returned to visit these relics this time, I felt a deeper sense of connection to them; one, admittedly, that I didn’t entirely understand. What about these objects had affected me so? I’ll confess, I am not religious. I don’t even consider myself spiritual, as many people who do not follow a religion will often say. I do, however, deeply appreciate the need to make peace with the fragile, transitory existence that all forms of life share in common. By preserving their physical remains, these figures were arrested from decay, and exist today as tangible memorials to their earthly forms. To many, they are sacred objects capable of miraculous healing and worthy of devotional pilgrimage. To me, they are objects of sad, quiet beauty — as deeply affecting as specimens preserved and displayed at a museum of natural history — that reflect the ephemeral, fleeting nature of being. Natural objects, La Specola, Florence. 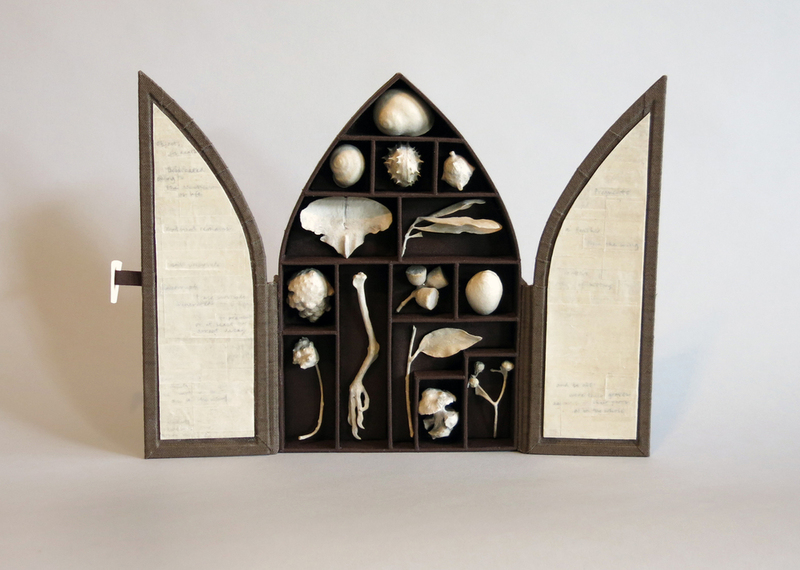 In designing Cult of Relics, I chose to focus on creating a reliquary to house objects derived from the natural world in order to afford these objects the same significance generally reserved for such relics of religious or spiritual importance. 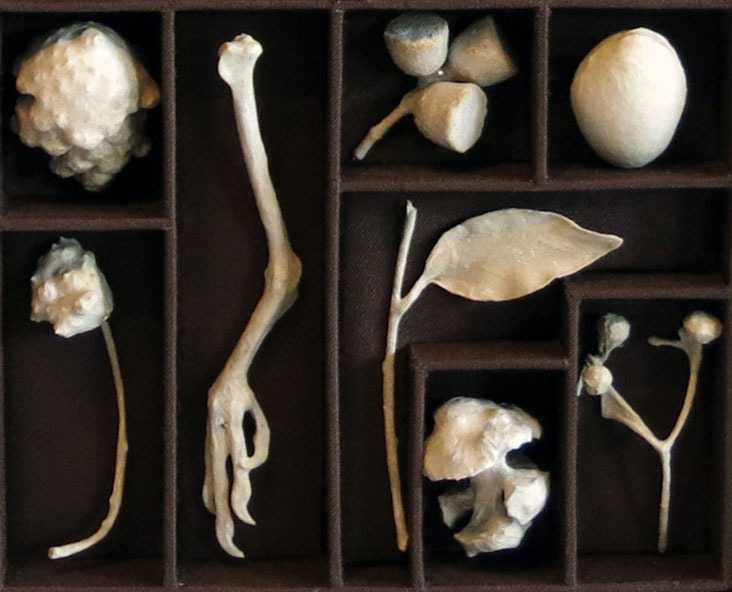 Over my three month stay in Cortona, I amassed a small collection of specimens ranging from cones and seed pods to snail shells and bird bones. I curated these found objects to holistically represent the winter landscape in Cortona, and meticulously wrapped each individual object in over-beaten handmade abaca fiber to mummify and preserve their fragile forms from decay. I then created a hand-built triptych enclosure out of board and cloth to house these unique and varying objects. Collectively, they speak to a specific place and time, but perhaps more importantly, they serve to call into question what we as humans choose to venerate and preserve. They too, for me at least, reflect the same sad, quiet beauty as the remains of Santa Caterina or Santa Margherita, and have become a tangible way for me process an important part of my personal history.